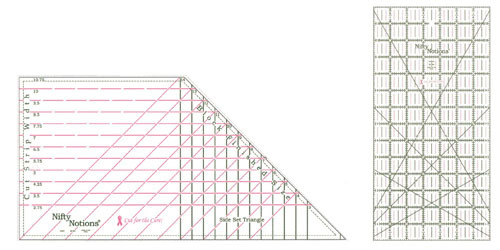 Kaye England designed these rulers to eliminate the math involved in adding seam allowances to finished blocks. It’s easy to add seam allowances to squares and rectangles, but once you start cutting triangles… I think I feel a migraine coming on. And I LIKE math! With Kaye’s rulers there’s nothing to calculate; you just decide on the finished size of your block and follow the corresponding lines on the rulers. Easy peasy! I’m also a big fan of the dashed pink and green markings; it’s easy to see exactly where the middle of the line is, no matter what color fabric I’m using. It’s an added bonus knowing that a portion of the proceeds from the sale of each ruler goes to the Susan G. Komen Breast Cancer Foundation. I have always loved this unit and had been working with loads of designs so it was a given. Doreen Speckman a quilting friend who has passed away, was the queen of “Peaky & Spike,” as she called the unit, so it was a bit of a tribute to her as well as showcasing the quilts. Two of the most exciting rulers to play with are the half rectangle and bias triangle. With these two rulers and a few other units you can create all 10 quilts in Spikes and Peaks. The most exciting element of this is that you really only have a FEW specific units to learn then all the quilts can be executed. “Magic Lanterns” uses the simple unit but it is the cutting and re-sewing that makes this quilt such a stunner. (see page 4 of the book) The cover quilt “Points & Peaks” uses the half rectangle ruler paired with half squares and a special cut unit to create this really complex star. As you move through the projects you can see how much fun it is to create with ease. As you work with the rulers, I recommend you don’t press these units until they are in the block to avoid any stretching of the bias. It does seem difficult at first but the results are really great. Kaye’s newest book, Christmas with Kaye, uses the same rulers for three quilts and three table runners. Make them in holiday colors or choose your own color scheme (just be sure to keep contrast between darks, mediums, and lights). 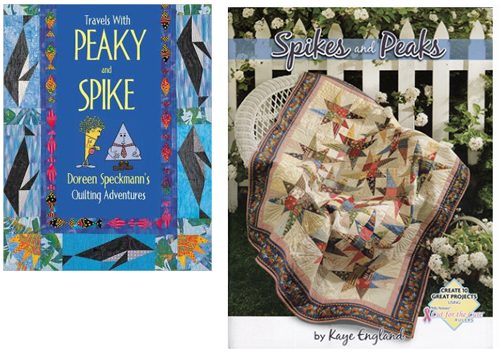 You can find both of Kaye’s books at your local independent quilt shop. 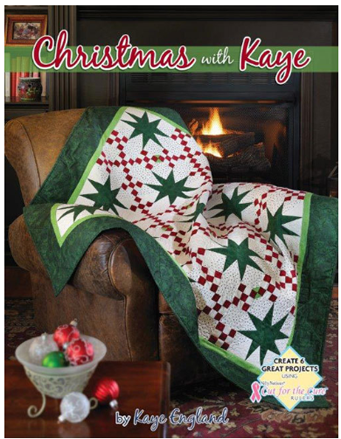 And we have a surprise for our readers: We’re giving away a copy of Christmas with Kaye PLUS all of the Cut for the Cure Rulers used to make the quilts in the book! The four shown above – Quarter Square, Half Square, Half Rectangle, and Bias Triangle – plus the Side Set Triangle Ruler and 7″ x 14″ Rectangle (one of my favorites!). I made a paper Santa Claus ornament for my mom, probably about 35 years ago. He’s got giant black circles for eyes and is dragging a giant sack of toys. I don’t know how it’s survived so long but it always goes near the top of my moms Christmas tree each year. Our tree is full if so many homemade ornaments that tell a story. I love it! When our daughters were little, I used to make them adorable outfits for Christmas. One year, I made them long dresses with pinafores in eyelet. The bib of the pinafore was free-motion embroidered with a fancy heart motif; this was before embroidery modules and computerized machines. LOL! My favorite holiday memory is a Christmas quilt I made for my husband. I went to enroll for a sewing class, however, they were all full. They told me that there were some spots still open in a quilt class. Little did I know that I would not really learn to sew in a quilting class…however, after much homework and many youtube videos, I can now say that I am a quilter and the Christmas quilt I made for my husband, with all of it’s mistakes and uneven seams, is my husband’s most cherished gift. My son and I had just moved to Vermont from Georgia. He had never seen snow or had the cold weather like the northern states. It was just a few weeks until Christmas and we had no decorations for the tree. So with a hard snow being predicted we made bows and angels out of paper doilies and decorated our tree. Didn’t have any lights but that was by far the most beautiful lite tree we had ever seen. He is 35 now and just got married a couple of weeks ago and I hope he can make memories with his children one day like we made that first year in Vermont. I have a Christmas ornament that a friend made for me about 35 years ago – it’s a small starfish painted to look like Santa. My tree isn’t properly dressed without it. Thanks for the great giveaway. I was a broke college student far away from home. I bought the saddest little tree the evening before Christmas eve (when it was on sale!) and then I made “bread dough” ornaments for the tree. I had friends over and we had a wonderful Christmas with the “home made” Christmas décor. It really brought home the concept that Christmas is not about money or things, it’s about the people and the memories. My mother gave me a Christmas quilt in 2009. The pattern is Disappearing 4-Patch. She died in August 2010. I cherish that quilt, as well as the memory of our last Christmas together. Today would have been her 90th birthday, and I miss her every day. I love the very first quilted Xmas wall hangings I made following the blocks shown by Eleanor Burns on PBS. I watched that series while my daughter was having her chemo treatments for ovarian cancer. I consider Eleanor as my first quilt teacher who taught me how to piece and quilt. Thank you for the chance to win, I would LOVE to win the rulers and book. I remember we make a giant 3D star for our neighbor lady who was going thru Cancer in 72. It took the whole living room floor to fold it and get it finished then very carefully put it on a canvas throw and covered it completely with melted wax and sprinkled it with glitter before the wax set and put it in her front yard. She had tears and wanted to know HOW we managed to get a paper star that big. But it stayed there until after Christmas and she told everyone that was her healing star. I loved stringing popcorn and cranberries with my sisters while watching Christmas movies like “Miracle on 34th street”. Made some holiday napkins for my sister. She uses them and requested another set this year. This year, I’m trying to make table runners or table mats for all my siblings. We’re all getting older and are more appreciative of hand made gifts! I made a poinsetta paper pieced quilt a few years ago and gave it to my daughter. She loved it! Years ago, our family (all adults then) decided that all gifts had to be homemade. We found some marble at a quarry and made everyone desk pen sets. Our most interesting gift was a slow cooker – my brother said he made the money to buy it! I love to make table runners and place mats for Christmas gifts. I love to see the happy look in their eyes when they open their gifts. Plus I really like to make a table runner for the Pollyanna gift exchange at my office party and I enjoy watching how many people take the table runner from each other . I absolutely love the Christmas stockings I made from old blue jeans for my whole family and have hanging on our fireplace each year. I did post tutorials on how I made them on my blog Nebraska Views if you are interested in seeing them or making some of your own. The very first quilt I made was a star Christmas table runner fpr my mother. I immediately made one just like it for myself. In April 2012, I ask my 4 year old godchild Riley what she wanted for her birthday. After careful consideration, she asked if I could make her a Christmas dress. I then asked what kind of dress would you like, her response, A dress with a star on the front because that’s how people found baby Jesus. For Christmas, I made her a dress with a star on the bodice with a nativity scene below. She loved it and so did I.
I made a cute Christmas tree mini-quilt for my sister-in-law with yoyo sad ornaments. She loved it! A few years ago my granddaughters wanted to make quilts for their parents for Christmas. Ex worked together for 6 weekends and the results were fantastic. Win, win, they had gifts to be proud of and I had a great time with them. My favorite Christmas decoration is cross-stitched angel that I made maybe 30 years ago for a favorite Aunt. It was about 8 inches tall and took a lot of time to do, but about five years later, I finally made another for myself. It hangs on my front door every year. My favorite memory is going to my grandmothers and getting oranges and apples for Christmas. My favorite memory is seeing my son, his wife and three kids all wearing the red pajamas I made for them!